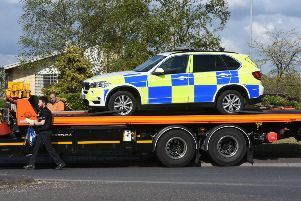 A man was seen being bundled into the boot of a car near Aldi in Spalding, prompting an appeal for witnesses from Lincolnshire Police. The car was parked on Winsover Road at the time. Officers have made a number of enquiries into this incident, including work on CCTV and locating other witnesses, but the exact circumstances relating to the report are still not clear, prompting an appeal for witnesses in the area at the time or from anyone who may have any information they think might help the enquiry. The alleged victim is described as a white man in his late 20s who was wearing a long-sleeved purple t-shirt that was purple in colour. One was of a stockier build than the other. The car is described as a blue saloon, possibly a BMW 3 Series.